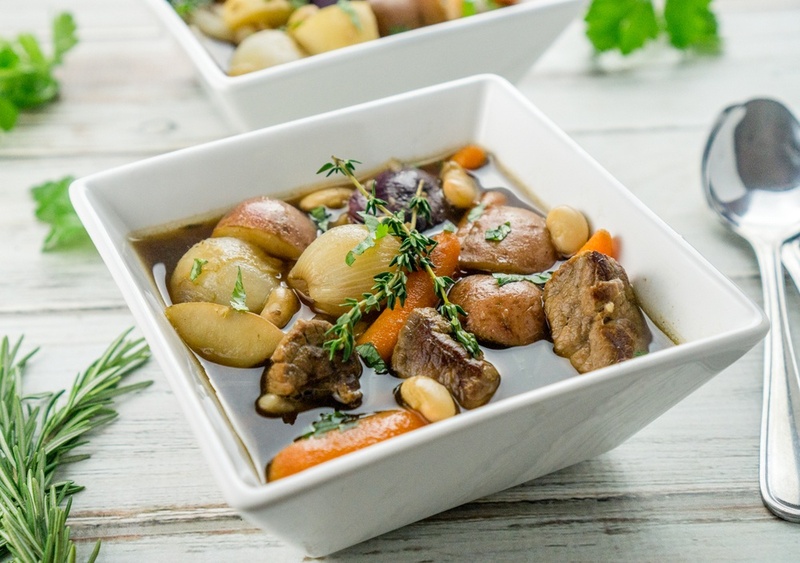 A fun twist on the Irish Stew, this Great Northern Irish Stew recipe uses beans and baby vegetables to create a truly hearty, delicious, gourmet stew! Heat 2 tablespoons olive oil in a large stew pot over high heat. Add the cubed beef and cook on high for about 3 minutes, or until the beef is browned on one side. Season generously with salt and pepper. Turn the meat and brown on the other side for about 3 minutes. Add the next 9 ingredients (Irish stout through fresh thyme) and bring the stew to a boil. Lower the heat, cover, and allow to simmer for 35-40 minutes, or until the stew has thickened, the vegetables are fully cooked, and the beef is tender. Remove from heat and garnish with fresh parsley leaves. Remove the cooked thyme and rosemary before serving.